As you may know, we have been working hard on our upcoming theme Extra, as well as our upcoming social sharing plugin Monarch. You will be excited to hear that we have also been dedicating a lot of time towards Divi, and we are pleased to release version 2.1 of the theme today. Divi 2.1 introduces several new features, as well as a ton of improvements and bug fixes, making it the most stable and feature-rich version of Divi yet! Most notable are Divi’s new One Page Website features, including Floating Side Navigation, Smooth Scrolling Anchor Links and a new Back To Top Button. This new feature lets you turn on a floating side navigation bar on a per page basis. This navigation bar auto detects the sections on your page and creates a dot indicator for each. The highlighted dot indicates the current section, and each dot is linked to its respective section. When clicked, these navigation items transport you to their relevant sections using a smooth scrolling animation. In addition, you can now enable a “back to top button.” Now your page header is only one click away for your viewers. This is a global feature that works great when combined with section navigation. Amidst the popularity of long-format, single-page websites, these features are the perfect compliment. With this update, the browser will smoothly scroll to any internal page links you add. You can assign a unique ID selector (i.e. section-id) in section and module settings, allowing you to link directly to that element. To link to this item, simply add a hashtag before the ID selector (i.e. <a href=”#section-id”>Visit This Section</a>). This is great for adding primary navigation items that link to specific sections or modules of a single-page website. By creating custom anchor links, you can easily create single page websites with Divi. For everything One-Page related, I have added a new in-depth tutorial in the Divi documentation. This is a very simple feature, and yet it opens up so many fun possibilities. We have added a new setting to all image modules that allows you to remove the space from below the image, letting it sit directly above the module or section below it. This lets your images “break the frame” in a controlled fashion. Divi’s new One Page Website features are just a tiny part of this update. The majority of our time was spent on fixing bugs that have been reported since the release of Divi 2.0. For a complete list of changes, please refer to the changelog below. – Users shouldn’t create sidebars with certain names. Added a note to the Widgets page. – Fixed the issue with lightbox on pages with several gallery modules. Lightbox scrolls through the images from a single gallery now. – Filterable Portfolio Module: Now it displays only selected categories, not all the categories selected projects assigned to. – Fixed the issue with module settings window visibility. It’s not hidden below the WordPress menu anymore. Such a brilliant design! Thank you Nick and team or such a great improvement that you been added, and know what, our client really loved it 🙂 please continue your successful work guys! You STILL cannot edit text in a text module in fullscreen mode! Nick, WHEN will you fix ALL the bugs in Divi!!!! Fix this “Great” theme before you tout the all the “hard work” that went into your bug fixes. I have been seeking a bug fix for over two months!!! Nothing but excuses and a runaround from ET. Disgusted. This is a GREAT theme. They are working hard, but they have priorities. Be thankful or please change themes. That simple. You really should’ve MEDITATED a little before going off for NO reason (very small reason, if at all – really). They are doing the best they can. If it is not good enough for you how about you find something else you’re satisfied with. …and while John is at it when are we going to get that “1 Click” button that will install WordPress with the Divi theme and a custom layout exactly the way my client needs it? You guys over at ET are slipping! Get on your game Nick. Please, update the changelog. I need to update my Divi webpage manualy. Oh, it is inside the package. You can add it to download section as well. ET has done a good job. I just made a made a onepage options for one of my client. Now it is even easier. Again, Divi is a awesome theme. This is a much appreciated update! Thank you for building such a great theme! ET continues to amaze me. What a great job guys, please continue the great work! Just a heads up that on the demo, once you click on one of the internal pages, like a project detail page, the navigation for the “one page” site doesn’t work anymore. Whoops, missed that. I have updated the demo. I’m using your divi theme to make a site, great theme, but my menu is not working as I’d like. If I add a page to the menu it works, but if I add sub menu items the top/parent item no longer links? Any suggestions I’ve tried everything…. DITTO! Any solution for this? Awesome! I can’t wait to see the improvements. You guys are so close – so close – to what I want. When I can build pages like exposure.co, then you’ll be there and I’ll jump on it. Divi is a beautiful tool. It’s the closest I’ve found for the vision of my site I have in mind. Just keep adding to it, please. Thank you ET! I’m excited to try the new features! I’d like to know can you add the ‘section-id’ update to any page on your site? Or does this function only work for single page web sites? Vince, linking to section ID’s works in any case. You can use the section ID, appended to the appropriate URL, to link to any section ID on your site. Thanks for answering! Can’t wait to start using it! It will be very good if you can ad a line in the contact form to “e-mail subject”. Here I was trying to fashion a one page website from Divi 2.0 and you guys are making it even easier. You will receive an update notification in your dashboard. You will need to install our Elegant Updater plugin as outlined here. i have the updater plugin – but no notification. That is a real parallax effect on the one-page website. The birds are moving faster than the wall in the background. I love Divi but I adore the inspiration that you guys give me. @Keith Davis, I’m very interested in exactly how to do something like those birds/parallax! I don’t think that you can Deb. Any chance of adding “subscribe to comments” on the posts Nick? Indeed amazing work! And how did you do the double parallax effect with the birds moving faster? A png with transparency on top of a background? It looks to be a creative use of photoshop (or other image editing program), the parallax effect, and the new transparent section option. In Photoshop, you’ve got 2 (or 3) separate layers: wall background, doves, woman. You composite the image as one and then export 2 png files. One will be the background and the other will be the woman and doves. I’m guessing they loaded the wall in as the background with parallax enabled and then used the woman and doves as a transparent slider. At any rate, it’s a really great idea that I plan on trying very soon!!! Great work ET!! Is the update available in wordpress dashboard or through the ET account? Yes, you will receive the update notification once your WP cron runs. If you don’t want to wait, then you can re-download the theme from the members are and re-install it. You just made my life 1000 times better. Thank you Nick and Team! Any news on compatibility with WooThemes Sensei eLearning plugin? I would love to see Sensei integration, too! Yes! REALLY hoping Divi 2.2 addresses this compatibility issue. The below link definitely helped, but didn’t solve everything. Yeah!!!!! You got the “back to top” (a personal peeve when it was missing) that you needed to make this THE most awesome template for 90% of my customers. Thank you, thank you, thank you!!! However, I watched the tutorial but it didn’t mention the “Back to Top” button and I can’t seem to get the button to appear. Is there a different option or method? Liking some of the new features but +1 for where to find the back to top button? I have been waiting for the social media share module which really is urgently needed I’d suggest. Support had informed me it would be in the next update? Is it? Otherwise – keep up the good work! Back to Top is located in ePanel General Settings, toward the bottom. Thanks was looking for this as well…. Great update, now I just need 3 more fixes for the Map Module. 1) Support for multiple custom markers. 3) An option to make the map 100% in height. We are still working hard on Extra. I would estimate its release to be in the next 1-2 months. Extra is also flexible like Divi ? Nick please more Menu visive personalization!!! I am loving the Divi theme! So much we can do with it. I especially love the page builder feature and how you can add a full-width background color to a section, in order to add some visual page separation between sections. So much coding had to go into trying to add that to a standard HTML website, but now I can do it with a click of a button, using the theme. That’s really helpful. Anyway, one question for you: is there a reason why Divi doesn’t offer an option to have a text-only site title in the header? It seems I can only insert a logo and it needs to be a fairly long/narrow logo (43px high). What about for those clients who don’t have a logo, so they’d like their company name displayed as text rather than as image? I don’t see a way to simply pull the site title and description from the wordpress dashboard > Settings > General page. Or, what about for those clients whose logos are boxy rather than horizontal in length? Their logos don’t fit in the space and look terrible forced that small (43px). I see that we can disable a setting for the nav bar within the epanel, and that allows for a tall logo to be inserted. However, doing that seems to force the nav bar links up to the top of the nav bar, leaving a large amount of white space, which doesn’t look aesthetically pleasing. Could you please consider this for any upcoming Divi updates, so that those who have no logo can opt for text and those who have different-shaped logos can still add them to the header/navbar without losing the clean look of the header/navbar? Thanks again for your team and all you do to make such terrific and useful themes. Good suggestions for the logo area Sherry. That is one area that could use some more customization in my opinion as well. I actually designed my own logo and made it wider than tall because of the way the logo is displayed. From some of the reading I have done, you may be able to customize the logo are by making some tweaks to the CSS. I know absolutely nothing about CSS at this point so I may be wrong. There was a blog post not long ago about http://www.nerdnomads.com. They customized their logo and actually made their own blog post on how to do the same. You can find the article in the comments section of this post…. Great upgrade!!!! Does this new version allow transparent headers or menus? Matias, I think it doesn’t yet, only for sections, but definitely a useful feature to consider. Wow. I’m a member for less than a year and I’m totally blown up with the way you do business. So many updates and improvements for a product as if you were a giant company as Apple. Yeah there is no such attention to other themes but with Divi you’ve really revolutionized the theme building industry. Thanks a lot. Be sure I will prolongate and update my subscription. Well done! AWESOME with a capital A and two exclamation marks!! Wonderful!! How do we enable the side navigation on an existing page? I’m not seeing the “ET Settings” box when I go to edit a page. I feel a little silly. Can you be more specific as to where I should look? You may need to enable it using the Screen Options tab at the top of the screen. Please open a ticket in our support forums if you need help with anything. I am sure that our team will be able to assist you. Having only recently downloaded Divi 2.0 and took it for a simple test drive, which we opted not to use for our current clients website project due to a few bugs. Now we see V2.1 out with many bugs fixed and extra features, we will be using it for our next clients website, by that time you will probably have another upgrade. Actually it does work. What is weird when I did the auto update it deleted my child theme for Divi…. scratchin my head. You guys are awesome. Thanks for always providing such amazing tools and support. It’s very evident that you guys truly care about your product and your customers, which in this day and age, is hard to find. We have a new tutorial on how to use all of the features mentioned above. ET team do it again!! thanks for all your work and efforts, you are simply the best… over the web. I am just getting started with Divi…..I have been trying to do something like this wine site with background images that stay still while other stuff scrolls. When you set a section BG image, there is an option within the section settings to “enable parallax effect.” You can use CSS Parallax to keep the image completely still, or use True Parallax effect to have the image move slightly (it’s a bit cooler looking). Excellent job and excelent theme. On my next subscription renew I think to purchase lifetime subscription just for this theme. It worths each $ spent on it. I can´t find the duplicated predefined layouts issue on the Divi 2.1 list of fixes and additions you´re providing on this post. Has it been fixed? I need to know if I should change anything in the patch I included in the functions.php file of the Divi child themes created by my Divi Children plugin. The current version of the patch relies on that issue having been fixed for versions of Divi newer than 2.0, so in case it was not addressed in Divi 2.1 I would need to modify that function before I release the next version of the Divi Children plugin (version 2.0 will be released in a few days). I to would like to know about this… I’ve made the fix for duplicated predefined layouts in 2.0 by changing the code per Luis’s instructions in the layouts.php file, rather than using his Divi Children 1.1 update… Will I need to do this or something similar again, with Divi 2.1, or is it hopefully fixed…? Divi 2.1 was release when the blog post was published. What’s the recommended updated process? Download and replace the core files? Or an auto-update with the divi theme updater plugin dealy? Using our Updater Plugin and updating automatically from within the dashboard is the best method. I have your Updater Plugin installed (set it up already) … don’t see any updates in the dashboard. Version is still 2.0 of Divi. Perfect timing! I just started the conversion to single page and was reading about plug-ins for Smooth Scrolling Anchor Links and Back To Top. You’re the best! My request “Back to top” button is here now. Can’t wait to update! You are awesome team. I was hoping there was going to be added functionality to allow us to change the “Designed by Elegant Themes | Powered by WordPress” line in the footer. Thanks Luis, been longing to have that option instead of creating child theme since I only tweak ET themes with CSS.. Thank you Luis! I’ll check it out! You have to set up your menus for every new theme, including child themes. Just go to Appearance > Menus > Manage Locations and select your existing menus (you don´t have to create them again from scratch, just select them for the desired locations). But in the next version can you add the carousel layout in gallery and slider modules? The new features sounds great! But extra theme, introducing the page builder in post? You should create a calendar plugin all the others out there (specifically Timely) are trying to destroy me. @Brent: Have you tried “The Events Calendar” from http://www.tri.be? We are using it on our website http://www.treffpunkt-jazz.de and it works great. Also the service of these guys is really good! YOU GUY$ ARE ON FIYAH!! Amazing improvements and demo! You can save the builder layouts from your existing pages and load them into your homepage builder layout. Just make sure that you choose not to ‘replace existing content’ when you do so. does it load them below the existing content? There is an option when you load a premade layout (look for the checkbox above your list of saved layouts) that let’s you choose whether to load the layout below your current layout, or replace your existing layout. This is insanely great. Your demos inspire me to want to design more sites! I’m already a lifetime member or I would give you more money. Is there a problem with existing sliders? Cannot update mine ..
WOW! Everything I wanted and more. I can’t wait to try it on my site and my clients sites. Love your work as usual ET. Your customer service, support & vision for future development is truly incredible. Innovation is being fought, found & conquered. I am holding my breath for a DIVI Ecommerce theme. But what you have created is absolutely awesome. We have used Divi for our new business since 1.0. We were developing a new version of it with a WooCommerce store, but not having a side-bar for category pages was a killer. I am soooo glad you fixed it. Divi is GREAT! Very Cool! Is hovering the the sign up form over the image something custom that you did, or am I missing a step in using the Builder? The’s a normal signup from inside the middle column in a 1/3, 1/3, 1/3 row. You can use the Divider module to add additional space above/blow a module. I also added an image module above the signup form and enabled the new stick image feature mention above, which allows the “50% off” banner to sit on the top edge of the form. Nick – that’s absolutely tricky and brilliant! After a few passes, my brain still kept telling me it’s a custom subscribe form vs. what you mechanically described. Making mental note for future usage – pronto. I would love to recreate something like that but instead of the subscribe from add a more complex form using contact form 7. Is this possible with the visual editor…? maybe a future tutorial on creating this ? Divi 2.1. is a step in the right direction. I personally love one-page website(s), now I’v got the needed tool @ Divi 2.1. Last month, I worked very hard to design a one-page / landing page for a client . . . I could not accomplish that with Divi 2.0. Hence, I used ET Convertible . . . that did a very nice job! Hey guys, we have just upgraded our old site to the new Divi theme and our customers are loving it, thanks so much. I don’t get why you’ve used circles for the navigation as you scroll down the page. It’s not very user friendly. The best one page sites. I’ve seen have the main navigation scroll down the page with you. What’s the thinking with the meaningless circles? The main navigation does scroll down with you, and the links in the menu take you to each section on the page. You can use either method, or both, as I have done in the demo to illustrate the new features. you should definitely inegrate a multilingual function (with button choice in the menu), a wide backups system (db + files + et settings + layouts) and please as soon as possibile the option to have a button in the menu. For this I would suggest using WPML. They have a great multi-lingual system that works exactly how you describe. +1 to add button in the menu. Hope ET support can help out on this! I love this theme and it has great features and flexibility but the one thing that frustrates made is the spacing in each module. It would be great to be able to easily adjust the margins and padding for each row and module. This is something that is available in other themes. Love it! Regarding the Sticky Images, when you say “letting it sit directly above the module or section below it. This lets your images ‘break the frame”’in a controlled fashion.” Does that mean there’s a way for an image to cross over into the section below it? Or does it just align the image to the bottom of the section? It aligns them to the bottom of the section. To make them break the frame even more, you could increase the margin value of the .et_pb_image_sticky class. oh cool. I’m having a bit of trouble though. something like this in custom CSS? Awesome work guys ! Perfect timing for my new project. I feel that ET is getting better and better since Divi was born. Also would be cool – for the header, when it shrinks on scroll, have the option for a different logo file for the smaller logo. Thank you, guys for your continuous effort and passion to make Divi even better! Read all the new tutorials, but I don’t see how to do Sticky Images. It’s a new setting in the image module. Seriously, is there no end to your ability to create? I hope you’re having fun, because the rest of us sure are. Thank you is a gross understatement! Absolutely brilliant work. This is by far the best theme created by you guys. I just purchased a one page theme from another company a week ago. Wish I would have waited… this looks great! Can’t wait to try it out. I note the changelog has not been updated in my account link for Divi! Also the previous point raised about not being able to change the header logo to the default WP Title and Tagline (Sherry), is such a shame – it seems such an obvious basic thing to have. And while I’m on that, if you check in the forums about solutions to that, support staff provide a way to change this by making changes to core files that will be overwritten next time there is an update (and I observe this quite regularly) – why is this practice allowed? You may need to clear your cache before the new version of the changelog will appear. when will it be available from the members area? at the moment only 2.0 is available. It is already available. If you are seeing 2.0 in the changelog, it is because your browser has the changelog file cached. The file has clearly been updated, so your browser must still be caching it somehow. Anyway, it doesn’t matter if the changelog is cached for you or not. You can still download 2.1 by clicking the “download” link in the members area. I am working on updating the look of my 1st Divi site to 2.0 and I have a voiceover site that I wanted to be a one-pager….You guys have made my life easier…again. This will be my 4th Divi site. Love it. Great work! This is fantastic, thanks. Is there a One Page layout we can load just to have a look at how the demo was done? Thanks goodness ET doesn’t take a whim on .0 versioning, one-pager would have been in 3.0 or 4.0! I used to complain about the lack of true parallax effect and I got the surprise to have it available a few weeks later. Also I opened a thread on the forum about the space below/above the image and voilà you added a sticky image feature. You are just awesome, guys! Or is this just a custom CSS item? Tiled background option in boxed layout really needed, ET should consider this fast! awesome! cannot wait for the update to install! I love this update, but I’m trying to replicate some of the elements on the One Page demo site and struggling to work out how you did it. I assume the part with the girl and the birds is all done using a full width section? Will there be a layout we can load to replicate this page? It’s a normal section, with a 1 column row and a single image module (the girl/birds). The section has a BG image set to parallax. The image uses the new setting to break the frame, and stick to the edge of the section below it. Ah, so the girl/birds photo IS a transparent image? ET team you have done a fabulous job . Great features added. But Nick I not able to see Divi 2.1 update in members area even after clearing cache and even tried with update plugin . Still no way I am able to Get Divi 2.1 . Please fix this I am about to start new project using one page Divi. If you click the “download” link in the member’s area, it will give you Divi 2.1. I am not sure why you are unable to see the correct changelog file. I has updated for me, so I am only assume that your browser still has it cached. Hi, I wonder what is the Parallax method in this demo? If you are experiencing any problems, please open a ticket in our support forums so that our tech support team can assist you. AWE-SOME !! You guys rock ! Thank you to think like us. must be cool for someone to say to himself ” We are the best in the whole world at what we do” here wordpress themes. But I am sure you are too humble to say that and keep going on and offering the best product out there. Great job. Great team. Great Support. Just one thing: could you add a bitcoin icon in your icon set. I have not read all the comments, but the “smooth scroll” feature seems buggy? If I enable it I can’t swipe left and right on my Magic Mouse in Chrome. If I disable “smooth scroll” my site behaves normal again and I am able to navigate in history via swiping gestures. Also nice with the “back to top” feature. But how about making it visible after x pixels instead of bottom? Haven’t tried anything yet, but like previous updates… these are great features that make a website count! Elegantthemes is definately on the good path! I’ve recently started to play around with Divi since I’m relaunching my personal site and really like a lot of it’s features. The one thing I’m not all that thrilled with is the blog post layouts. I’m currently using another ET theme, Vertex, and I LOVE the way the blog posts look with the parallax header. Is there a way to do this in Divi that I’m not aware of? Is it possible to run a full screen slideshow in DIVI? The update and features look great… however, I’ve spent a few hours testing Divi 2.1 (upgraded from Divi 2.0 which was working ok) and there are lots of little bugs – too many to open tickets for all of them. The bugs seems to revolve around having a child theme active. Anyway I’ve reverted to the previous version and will hang on a bit before I try again. I downloaded the Divi package this morning and attempted to install the updated theme (since there is no auto-update available), but it failed twice – says the directory already exists. thoughts? please help ASAP. Before you can upload a new version of the theme, you must first delete the old one. 1. The pad at the top of the image of main header was set to zero ! Already add a custom code and now is working ok ! 2. Images, blurbs and counters in sections simply disapear ! 3. Image of the header is far diferent than it was before the update ! Already submit a support and I am waiting for a solution. In my opinion is better to wait some days before doing the update. In my case I regret to do it as I have my boss calling me each half an hour !!! If there’s one major thing I’m looking for, it’s how to easily change a text’s font/colour/size. What is the best way to do that? Whether it be for a heading, or just a paragraph of text. Come on Nick! Instead of touting how great this release is how about admitting what a buggy piece of junk this is? This release has more bugs than any other. I can do no work on my sites! NO TEXT EDITING, NO ORDERED LISTS!! ALL FORMATTING LOST!! Did any one at ET even test this mess? Look at the support logs in ONE DAY! Simple and basic functions destroyed. Stop putting the blame on your paying customers and stop blowing smoke and fix this mess! That ET support’s usual response is that there is no problem and the problem is with individual installations shows me that this mess will never be fixed! Time to find a theme that actually provides basic functionality from a company that can provide the same and take responsibility for their own mess. You can request a refund via the contact form here if you are unhappy with the theme. Just mention our conversion in the email if you are passed the normal 30 day refund window. As for any bugs that are reported for 2.1, they will be fixed as soon as possible. The lack of proper bulleted list formatting in text content has already been logged and fixed internally, and we are providing users with a temporary CSS patch until 2.1.1 is released. If you have more bugs to report, please detail them in your support ticket so that we can be made aware of them. We asked for more information in your current support ticket, but you responded: “No. You are well aware of all the bugs in this release and I cannot afford wasting anymore time on your lousy bug-filled themes.” Unfortunately it’s quite hard to help you when you wont give us any info, but we are doing our best regardless. Great job guys. Both your themes and your newsletters are top quality! This is giving me great ideas for an RSVP site/page for my upcoming wedding. Feel free to borrow as much or as little as you choose. Hello guys. This is completely awesome! Keep up that good job! Thanks for Divi 2.1.1. my Web is now updated and working optimally. Thanks for the hard work ET Team. Love the update, just curious will you be adding a feature of removing the gap from the top, left, or right instead of just the bottom on images down the road. I’m sure I can make do with css for now but I do like to be able to edit without it. The removal of the space at the bottom of the sticky image is awesome. Thx for everything , this i great ! I’d invest into Elegant Themes anyday! So when Page Builder ported to Posts too? This Year have a chance? This is most requested and I believe most searched on support forum. Divi is a great theme! Amen, Brother-Friend! Would LOVE to see Page Builder work with Posts. Any chance we can get that layout to play with? I’m still very new here, and while thoroughly impressed with divi, i sometimes have a hard time figuring out what you used where in the demos, a layout for reverse-engineering would be awesome. Oooh thanks, i see now, the photoshop part is easy to do, what confused me was that i thought it was a fullwidth slider they were using there, and now i see it’s just a fullwidth section. Easy to implement in a section, disaster in the slider. I think I’m going to stop using the slider completely… maybe use one of the image carousel plugins to get images below a fullwidth section like they used here… i need to research whether the portfolio carousel can be used for ordinary photos, not just projects. Do the theme updates percolate down to the child themes automatically? Divi is the webDesigners Rock’n’Roll Base. Continue to love this theme! Just updated all my Divi sites to 2.1 yesterday. Now I see 2.1.1 is out. I can’t find any changelog info. Would you post a link? Clicking on the 2.1.1 Details link in WP just takes you to 2.1 changelog. Sounds like you need to clear your cache. You guys are the rockstars of theme development. Well done Nick and the team. This is great! I really love Divi. I’m wondering if there will come a time when Divi has a magazine layout. Or is that beyond the scope? I would also love to see elegant themes come up with an elegant form builder plugin. That would be awesome. I love the new features, but I’m missing something here; no one else has commented on the fact that these features don’t work on mobile unless you’re using Chrome. I read the blog on my iPad and use Mercury as a browser. There is no side navigation, etc. unless I use Chrome, which I don’t. The site is even worse using Safari for mobile. The slider image shows only a pixelated background and other components are totally missing. To make matters worse, I still don’t understand why Divi parallax does not work on mobile browsers. Other than that, I’m enjoying Divi! Not sure if this is a bug or on my end, but whenever I make edits within page builder’s text module settings to the HTML (i use the text tab, NOT the visual tab btw…) after saving and updating, they look great. HOWEVER, if i go back into that same code and have to make additional edits, all the previous edits will be lost. This seems to crop up when using specifically… i have to add it as a or it won’t work. next time i have to re-change all into AGAIN or they won’t work. I refuse to update it anymore. 3 times in 3 days and we never get told what the 2.1 and 2.2 have in them so I know to see what broke again. Just check the changelog, found it both your WordPress dashboard and the Elegant Themes members area. We update our themes to make them better. No one is forcing you to update, but I don’t see why you would ever want to use an old version of theme, or why anyone would ever be angry that we are improving our themes and fixing bugs. Change log does not list anything other than 2.1 that was dont 3 days ago. As far as my wordpress dashboard. All we get is there is an update and a version number. You have version 2.1.1 installed. Update to 2.1.2. That means you need to clear your cache. Your browser will cache files in order to improve loading times. If a file has been cached, such as our changelog text file, then you wont see the new version. You can learn more about browser caching here. Your cache can easily be cleared, here are some tutorials for: Chrome, Firefox, IE and Safari. The latest change log in the members area is 2.1.1 and, unless I’m mistaken, you can’t see the changelog through WordPress if you’re already upgraded (yeah, should have looked first). Please don’t tell me to clear my cache. The dashboard reply was in response to the OP, who “refuses to update,” and therefore can certainly still see the changelog in his dashboard. Aside from caching, there is no other explanation that I can think of. Both the members area and the Dashboard link to the same text file, and if you are seeing 2.1.1, then that text file has been cached in your browser. With a clear cache, this is what is displayed. Any word on my browser issue? I can’t be the only one who notices that these features and parallax are not working in Safari and other browsers. You need to check out your demo in Safari. It looks really bad. And, I cleared my cache! I wasn’t clear on the above. The issues I’m speaking of are with Safari mobile. Your demo only works on Chrome for mobile. If you are experiencing any problems, please open a ticket in our support forums so that our team can take a look. I’m not having a problem, your theme has a problem. I’m sure you had to have tested it on different browsers for mobile. As stated, the Divi demo is a total bust on Safari on ipad along with other browsers …the only exception is Chrome. Why you refuse to at least address the issue is beyond me. If you have a multiple page website, will the single page navigation links work? I created a new page with a secondary menu, but when I click on the links in the menu, it takes me to the beginning of my home page. Not to the downpage links. Am I doing something wrong? Feature idea: make the slider more modulable/editable for drag and drop twits like me. for instance transform the slider into a top level section that can hold modules like the others. so we can place elements right inside different slides as if it were any other section. enable different animations for those modules and it’s done. the only problem i see is defining individual slides as something between a section and a module, in order for each to be customizable? maybe a tabbed section? Thank you, the theme is off the hook fantastic! Are anyone others having problem with mobile menus on the one page sites? I clicks on the mobile menu links with # in them and no thing happen. Sorry for bad English. How do you enable the “back to top button” ? Divi is fantastic, I work every day to be learning your options. Hello, I am Brazilian and his client, sorry my english .. rsrrs .. Today I updated my wordpress theme DIV, however, was unable to create the same effect as equal to the banners you show on the blog, the effects of the banners remain equal to version 2.0. How do I do the same as you showed? Hey! So I am using the Divi Theme for the first time and it is so awesome! I am in the process of creating a Location Page for my website with a map of my business. However, I am unable to see it when I update the page! What is going on?! But I miss some button elements. I know that the old button shortcodes still is available, but they are not in “Divi” style. And the only button we have now is the use of the Call to Action element (with no text). Two quick questions: Is there a pre made layout available for the one-page theme option? Is there a way to control the side navigation dots, ie. decide how many dots there are and where they lead to? AHHH-MAZING! You guys are a breath of fresh air! Thank you Thank you THANK YOU!! I bow down to your genius! Loving your support, updates and beautiful designs. Finally built my first ‘site’ using Divi 2.1. It’s mainly a single page now: “WordPress Newsboard” at http://bowo.io/wpnews, aggregating news feeds from 40+ WordPress-centric sites. Is it possible to make the main menu transparent or make an “glass” effect as background? Dear Elegant Themes, You rock! We finally finished our WooCommerce powered site using Divi. Thank you for Divi and for this update, it has been a life saver. We are so happy with the way our site turned out and it would have been much harder without you guys! Wy we Can’t preview the portfolio grid mode a lightbox with the projects instead direct for a project under link? Cant we have 2 options link and preview instead the + on the project grids hover? Member x 2 years, medium level web builder, but newbie in practical terms at Elegant Themes, because I’m just now getting around to actually using a theme. So, as a newbie, it’s a little frustrating, but I can offer you a newbie’s point of view which might be valuable to you, the Elegant Themes guys n gals. Specifically? Examples: the background video, the best size and resolution of slides, the logo formatting, to point out a few. The background video, in particular. I wandered off all by myself into the vast Internet and found out how to develop a .webm video and use it as an mpg4 alternate and so on. But actually getting it to work…still wrestling with that. Various moderator comments in some old posts. How to enlarge a logo: I played with the search function here and finally found a moderator’s remark in an old post about using a CSS line to fix that. So, my point is: you really need a quick-find method–an index or topic heading–for users to locate basic points: enlarging a logo, installing blurb images vs blurb fonts, and so on. A sort of site map for the clueless. Thanks. I second Westgate’s comments. Better documentation would be nice. No one responded to the above comments about Divi only working with Chrome on iPads and not Safari and other browsers. Anyone know how to have a pause/play button on the background video screen? Since my web site is pushing a graphic novel, this sort of thing would be cool. I know Nick is as smart as the PayPal webheads. Hope this is the right spot to ask this. Thanks. On a different note…when are you going to make the Elegant Themes website responsive? Just curious. Heh heh. You guys rock. Divi rocks. Would it be possible to have the one page’s layout ? (like the others layouts that you can load in a new page). A big “thank you” for this amazing theme !!! 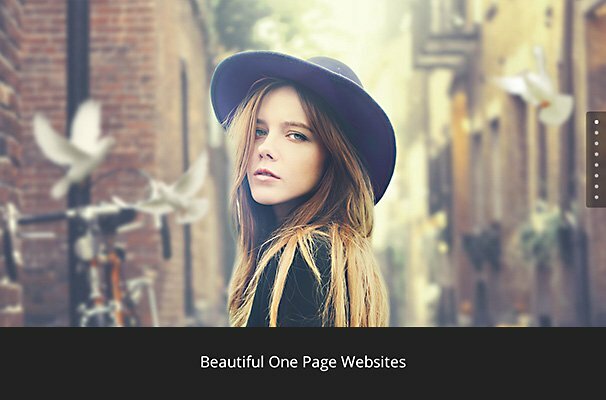 How can I get my background image in a full width section to render in the same dimensions as the one you show in this information page for the one page DIVI set up – the pic with the girl and the birds and buildings in background. My image height gets cut. Also, when using a blue section, and opting for a 1/3 X 3 section, when placing images in the modules, they don’t get centred on page..why can’t we have an option to justify images? 1. I’m a big fan of vertical headers (or is it a sidebar? whatever) but there’s only one option with Divi: a fixed vertical header on the left and the content on the right. I’m focusing on conversion and I know the eyes always land on the upper left side of the screen first, so I’d like to see my content there and not the vertical header. You should really add an option to put a vertical header on the right side, with the content on the left. And another option to remove its ‘fixed-ness’ and let it scroll down with the rest of the page so that we can use that space to put more ads, more optin-boxes, whatever. This for me are the most VITAL and possible deal breakers to Divi. 2. localize and RTL it. Extra karma points if you can translate it to Hebrew, but just having it localised and RTLed is a BIG BIG bonus – I have no idea how to do it myself. 3. Add the option to put an image in the subscribe module. This would be great to put an ebook image next to the offer there and increase conversations. I was quite surprised its not possible (according to the demo, correct me if I’m wrong). 4. put the option to put widgets with modules above the fold. for example id like to put a big option box above the content when it’s on vertical design. If you could only make one change – number 1 is the most crucial no doubt. Thanks a lot, looking forward for that! I was searching for support for RTL in the divi theme and arrived at your input. Last April I tried to use Divi as a RTL theme with no success. Many issues came up that the support team could not solve. Have you been able to make a hebrew site using Divi? Would love to hear your feed back. This would be for sure also a very nice enhancement of the builder, I don’t specificaly wan’t to hide the builder modules from users, but much more have control of who shall add, modify and delete new columns, sections, modules and rows. Its really a problem when a not experienced user is able to modify layout. When can we count with a better builder admin control ? I had my first WordPress workshop several years ago. As a .net and VB person I was looking for flexibility that WP couldn’t offer. Divi has persuaded me to finally dive in the WP-world. And it rocks. Great work! I have one question though: Dividers can add more whitespace. But in fact, there is already quite some white space between the sections and blocks. In mobile views it’s even a bit too much to my liking. I tried to find how to decrease vertical whitespace between sections. Automatic white space could be decreased if one could place conditional dividers, e.g. based on screensize. Might be a nice feature. I assume that the same effect is now achievable with CSS. I tried to drop a few (padding-top) altered lines in the CSS box but to no avail. Can you help me? is it possible to create a “Slide-Down” menu with Divi like used here? I really like the way the menu slides down and covers the background for better readability. 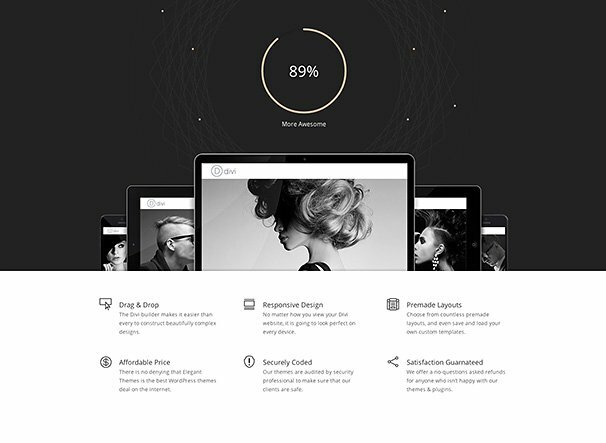 Divi is revolutionary and a joy to work with – so please let me remove the logo and I can finish a great site. The latest version of 2.1.4. Please update to ensure compatibility. Has that Safari parallax issue been resolved yet? The white text on my site stays over a white area of the background image on the iPad and can’t be seen. It rolls nicely up over a dark area on the Mac. Is there a way to select which sections of a one-page-website you don’t want to see/select on the navigation bar? My problem is that I have many items (dividers) in my one-page-website and the navigation is very long and not eye pleasing at all. You can create a custom nav bar using the Appearances > Menus system in the WordPress Dashboard. I suggest that Divi should have a built in retina function, height function, and alt logo display for scrolling (e.g black and white switch display when scrolling). I don’t really understand why you guys didn’t implement that nowadays basic built-in functions in such innovative themes like Divi. Many times I hesitate to subscribe for a lifetime membership because of this. However, Divi is very very attractive because of its UI – UX modules, as the option UI panel should be in a better design (I wish). Hi, I am using Divi version 1.7, but I want to update the theme to Divi 2.1.4 without messing the whole site up. I have added some custom CSS, but when I update the the theme, the whole site looks ridiculous. I like how my slider looks now, but when updated it’s too big – how to keep it in those dimensions? How can I add additional font icons to your font icons? I’m in the same boat.. was there ever an answer to this? Can we add additional icons? Hi All ,anyone can tell me how to show my optin form on above the image.which is the same on the second image at the top of this page. I really love this to do. I think there’s a problem with divi’s Mobile Nav on version 2.1.4. Can you help me to fix this one? Looks like the Page Builder still can’t be used with Custom Post Types… is that so? If it is, any clue about if and when it will be implemented? Most of my current sites are 90% CPT-based – and my clients will sure love to use the Page Builder with them. it would be so awesome if non page builder pages (such as standard posts) could have both right and left sidebars as a layout option. Full width, Left Sidebar, Right Sidebar, and Both Left and Right. This is kind of ignorant but I want to know how will I be able to load this one-page theme from divi? I am currently using Divi theme and would like to use this exact layout for my site. I tried searching the name template “One Page Layout” from the Page Builder but it’s not giving me any results. Where exactly do I find this layout from the options? The first theme that I loved and translated to my native language! Whenever I try to create a new page, the contents of that page stack on the contents of the home page. What should I do? However, I have two problems with this as I prefer a more traditional look. 1. The limit is characters and not words creating the problem of cutting words in the middle. Is there any simple fix to this? 2. I’m missing the “…” in the end where the excerpt is cut. How do I incorporate that? Hi Nick, I have a GPL 2.0 version of DIVI theme and I created a one page parallax website using that version. But I have problems in scrolling animate effect, my question is how can I update the theme 2.0 to 2.1 by not reinstalling the theme? but when i place a blurb with the same anchor-link on a different subsite (of the same website) the browser scrolls too far down that the headline of the section is already under the menu and not readable. it looks like the browser forgets that theres a menu and let start the section where the browser starts and not after the menu … very wired. so on same page it works perfect but coming form another subpage it scrolls too far. First of all…Divi is a great theme and my site visitors have nothing but praise for our new website! Session/visit durations have increased massively since we launched. I have only one small irritation with the text editor. Could you please, please make it fixed? That would remove all the scrolling up and down to view/amend changes in the text body while using the editor. And thanks for all the hard work you guys at ET have put into making us all look good. It’s called “Divi Settings” now. I have a one page site and one of the tabs on that page goes to the blog page which opens up in a separate page. All this time the header remains the same on the homepage and the blog page. When I click on an item to go back to the one-page site item, the section doesn’t properly align. Half of the section is displayed and the other half is not displayed.